One of the most interesting annuals I planted in the garden this year was the wooly morning glory, Argyreia nervosa. Also called Hawaiian woodrose and elephant creeper this plant is native to India and while perennial there and in any similar tropical locale, it is very frost sensitive. My first frost occurred on October 13th of this year. This vine takes quite a while to get growing. It loves a warm, humid summer. It was the end of July before it reached for the rooster on the tutuer and then, in the heat of August, it grew inches every day. The leaves are large, the size of a ping pong paddle and the new growth is softly grey and textured. The sinuous vine searches for a structure to envelop and wraps itself with thick purpose climbing higher each day. Argyreia nervosa is in the Convolvulaceae family which is the same as the morning glory, sweet potato and bindweed. There are over 1,000 species in this family. 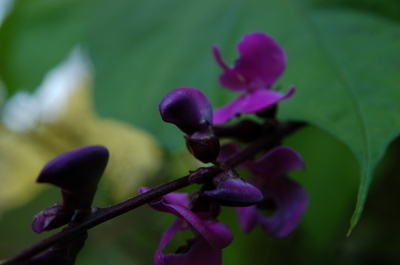 This vine flowers if grown in the tropics but here the season is just too short. 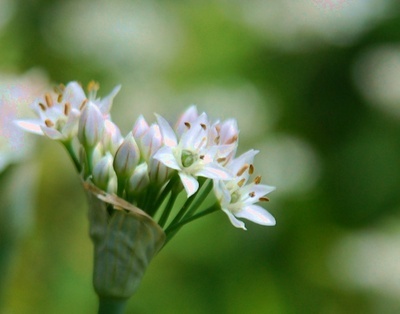 It would also produce seed pods if it flowered. The seeds contain a chemical compound, LSA, similar to LSD and with the same psychedelic/hallucinogenic effect. Perhaps just the act of growing inspires a similar effect as I swear that I saw Jack climbing this beanstalk-like vine on more than one occasion and friends have reported similar sightings. A heavy frost has reduced this vine to a sinister version of itself. The withered leaves are hanging as if ready for Halloween. I find it almost as striking in death as I did in its life. Any plant which has such large tropical foliage and which shows measurable growth each day is a welcome addition to my garden. What was the greatest conversation piece in your garden this past season? It is Bloom Day once again and there is a wealth of color here this year. August always makes me realize the value of annual flowers in beds and borders. The perennials blooming in August don't carry the show quite as well as those of June. I love the blue of these petunias which do require a bit of deadheading but then how else does a gardener acquire a green thumb? I was generous with planting annuals this year since there was a garden tour here in June. I have found that it doesn't pay to be stingy with the annuals if you do want a good play of late color. Of course there are perennials blooming as well. The Helianthus 'Lemon Queen' is quite large and stately and the little oregano, Origanum rotundifolium 'Kent Beauty' is subtle but interesting. Phlox is in color at the moment and this one has re-seeded in solid purple from the original 'Laura' which has a white eye. It is fragrant and more vibrant than many of the self seeded phlox. Calamintha is small but has a profusion of flowers which add texture and contrast to the garden. 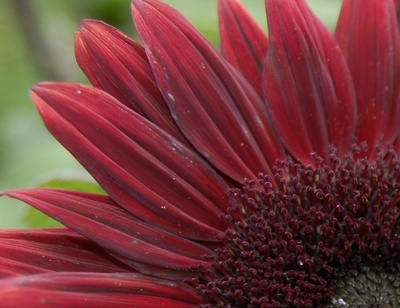 The coneflowers are blooming in abundance with tattered flowers on the same stalk as the fresh newly opened blooms. Time to deadhead. Deadheading is really the name of the game in August to keep colors fresh. I tried this new torenia in Lady Athena's crown and I am quite pleased with its performance. Such a shallow container requires quite a bit of watering and this torenia sulks a bit to let me know I have been ignoring this task. There is nothing quite as heavenly as the clear blue of the morning glory. The color is breathtaking in the morning light. I have sometimes forgotten to plant some of these but not this year. I hope you remembered to plant some as well. 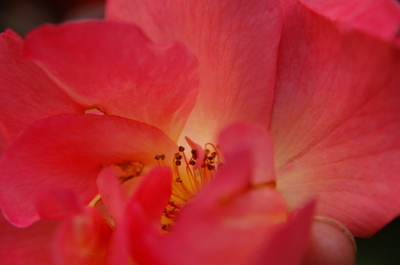 So, what is blooming in your garden? I do hope to visit and see for myself. Many thanks to Carol of May Dreams for hosting yet another installment of Bloom Day. Click on over to say hello to her and visit gardens from across the world on Bloom Day. My son named this plant 'Cousin It'. Cousin It is from 'The Addam's Family' which was a hit in the 60's. I was just a child then so he must have been watching re-runs to make this connection. It does bear some resemblance. He noticed it from the living room window. It has taken over the bird feeder post with vining, thick tendrils and it has been late to bloom. Frost is imminent here and I was a bit concerned that I would not see any flowers but they are appearing and they are worth the wait. Spanish flag is a common name for this plant and the Latin name, Ipomoea lobata shows its relation to its cousin, the morning glory, Ipomoea tricolor. This reminds me that I did not plant 'Heavenly Blue' this year and now I miss it. Maybe these two would look interesting twining together. I guess late bloom is normal with this family of plants. 'Heavenly Blue' takes its sweet time blooming for me. I will plant this one again. It is a bit unusual and the flowers are quite lovely. Have any of you grown Spanish flag? Did it bloom late for you? Has anyone grown Mexican Sunflower, Tithonia rotundiflora? 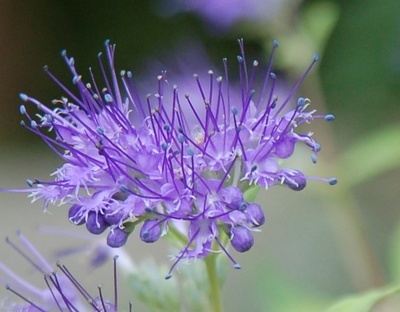 I grew it from seed several years ago after seeing it at Tower Hill Botanic Garden. You have got to love the bright orange, zinnia like flowers. The first year I grew it in average garden soil and the plants grew to about four feet at the most. Here my friend, Denise, is taking a nap next to them. Her outfit does match them quite nicely and she provides nice scale and proportion for the plant. She is of average height. The plants were unfazed by warm, dry weather and, in fact, they did thrive in those conditions. You know how it goes with many annuals, you try them, like them, and then make room to try something else. Tithonia has been on my list to plant again and this year a friend gave me two plants which she started from seed. I put them in the flower bed right in front of the living room window since this plant does attract bees, butterflies and hummingbirds and I often watch from inside. Who knew what would happen. They are making a nice green curtain right about now. in life or in the garden, it is important to change perspective, to look at a particularly challenging area from a different angle or approach. Sometimes the area in question will dictate usage as in the adage 'Form follows function'. And so, I am appreciating the new garden area right in front of the greenhouse/office. Spring flooding necessitated rethinking the area and three pots were chosen and planted up for this spot. I truly enjoy the challenge of container gardening. As the summer progresses, the watering needs of the containers increase and repeat fertilization is also important. I use a liquid fish fertilizer and you can see that the plants have responded nicely. I need to do a bit of pruning on these by the greenhouse but pruning is also an anticipated chore and not one that gets as much attention as watering. If you don't manage the vigorous growers such as this sweet potato vine and coleus, they will (and seem to have here) take over the pot. Picking a color combination, choosing the plants to fill the container, and then waiting and watching as they fill out and certain plants flourish in the container while others lazily hide amidst the thugs is a great summer past time. They initially look so nice and neat. As the heat of summer progresses and watering requirements are heightened with the heat, they explode with growth. The containers by the pool have gotten a bit out of control but, from a distance, add more interest to the area. I do like the smoldering dark colors for a change. Did you plant containers this year and, if so, what is working best for you? We have had beautiful weather in New England this spring if you discount that week with the thirteen plus inches of rain which fell all at once. Otherwise, we have had ample moisture, many days of warm temperatures sprinkled with the usual cooler days. We had an early warm spell which has driven many to actually plant tomatoes and set out the warm weather annuals. A friend of mine who runs a garden center told me that many of the growers are out of tomato plants. What will happen if there is a serious frost in the next two weeks? There will be a scramble for the plants left at the garden centers. Some will be caught short. Traditionally, Memorial Day weekend is planting weekend for warm weather crops in southern New England. The last full moon in May is on the 27th and no farmer from days of yore would ever plant his tomatoes before that full moon. This is really just a guideline as frost can still occur after the last full moon. I am left wondering what has happened to those common sense rules of gardening? There are few working farms left in my town even though there is now a resurgence in locally grown produce and more land is returning to cultivation. Still, land is worth more as a house lot than for vegetable growing. There are plants you can use in containers which are frost resistant. I planted up a few early in April which is about the time that the gardening bug is at its' most feverish point but it is also too early to do much but clean up the garden. The container by the garage is a bit battered and best viewed from a distance. This is planted with Sedum 'Angelina', Euphorbia 'Tiny Tim' and pansies. Viola 'Etain' is also lovely in a container. This one needs some additions but for now sports only the viola. You can also plant lettuce in the garden or in containers. This container is handier for me as it is closer to the kitchen. The feathery plant is cilantro and violas, once again, add some color. The cilantro is ready for picking but the lettuce needs another week or two. In two weeks I will be planting the other containers with the tender annuals. Well, two weeks and a few days since the full moon is on the 27th. Why take a chance with Mother Nature? I find that she usually wins. 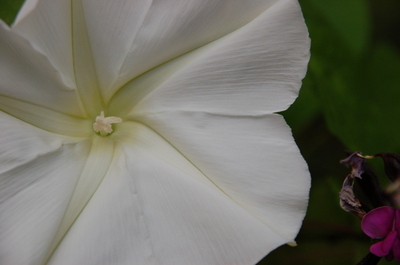 I have read that the moonflower, Ipomoea alba, can open in just a minute or two. I haven't yet caught it in the act but it is a spectacular flower. Perfection of symmetry and color, even the stamens and anthers are white. 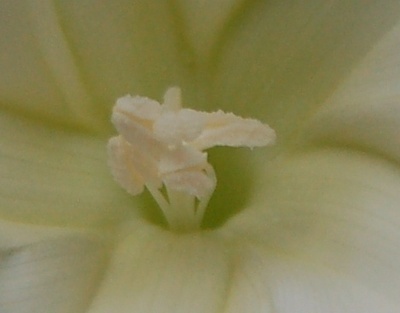 I think it could be called the moon/star flower as there is a definite star in the center of the blossom. How does nature create such perfection. 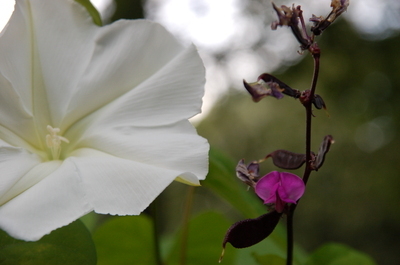 The vine is a bit coarse and looks like the other members of its' morning glory, Convolvulaceae, family. It has grown quite quickly on the pyramidal support and would grow even taller if it could. Its' runners are drifting in search of further support but with little luck. Without a bloom, it is nondescript. In bloom, the moonflower is what dreams are made of. 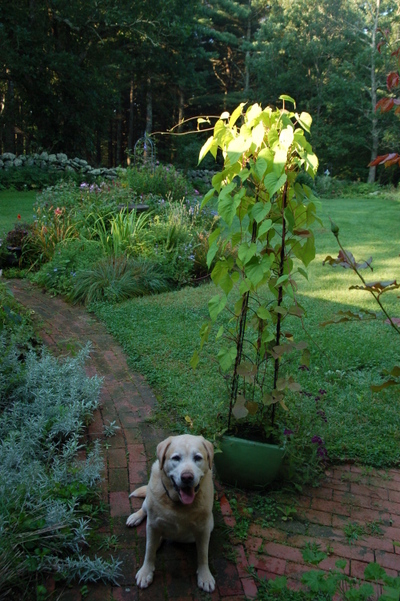 The hyacinth beans, courtesy of Hank over at Lake County, add a bit more color and interest to the trellis and the vines are intertwined making this trellis one of moonbeans. I am only catching a light fragrance from the flowers but the nights have been cool which may reduce the intensity of scent. Have you grown this? 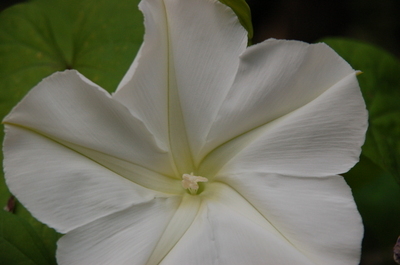 I grew it because of all the comments on blogs last summer so if you posted a picture of a moonflower, or a description of its' charms, you are responsible for this gardener's celestial adventure.